Those of you who have been around me for any length of time know that I am obsessed with the whole idea of Mothman–the bizarre winged creature who is said to have terrorized the town of Pt. Pleasant, West Virginia back in the late 1960s. Some say the creature never left the area and can still be found lurking the countryside, especially out in the woods around what is now known as the TNT Area. So naturally, when I moved to Ohio in 1999, one of the places that was high on my list of locations I have to visit was Pt. Pleasant. In late 2002, long before the annual Mothman Festival had grown to the wonderful spectacle that it is today (even before the unveiling of the Mothman Statue in the center of town), I crossed over the Ohio River and ventured into the sleepy town of Pt. Pleasant. My first stop was to be Criminal Records, a local record store owned by Jeff Wamsley, which was supposed to be filled with lots of Mothman memorabilia. Sadly, the store was closed when I got there, so I never got the chance to see what was on display there. Oddly enough, years later, I would be contacted by Jeff and asked to speak at the annual Mothman Festival. And while I was sad when I showed up and found that Criminal Records was no more, I was quite excited to find that Jeff had turned his collection of Mothman memorabilia into a full-blown Mothman Museum. On that particular day, though, there was no memorabilia to be found. There were a few stores that were still open, but there was nothing Mothman-related anywhere (which is quite surprising because today, every store on the main strip has a wide selection). Feeling rather dejected, I decided to stop in at the Harris Steak House to take a few pictures since it had been featured in the Mothman Prophecies movies that had just been released. Peeking inside, I noticed a few Mothman t-shirts hanging on the wall behind a woman sitting quietly at the counter. I walked in and immediately saw this Mothman plush toy and quickly snatched it up. I haven’t seen another one like it since! Right after paying for it (along with several shirts), I placed him on Ol’ Blue’s dashboard and let him lead the way out to the TNT Area. Acquired in late 2002. Purchased from the famous Harris Steak House before heading out to check out the TNT area. Looking back, while I must admit that I had no idea who she was at the time, the woman who waited on me was none other than Carolin Harris herself! Today, I’ve not only had the opportunity to speak with her at several Mothman Festivals I’ve attended (and spoke at) over the years, but I even had the unique opportunity to be part of one of Ms. Harris’ evening tours through the TNT area. As for the plush toy himself, how old he is remains a mystery. A search on the Internet proved fruitless, although versions of him pop up on a few web sites, including Roadside America. No information about the plush is given, however. The tag attached to him reads simply “Mothman / Made especially for Point Pleasant, WV / http://www.moth-man.com”. The web site no longer exists. 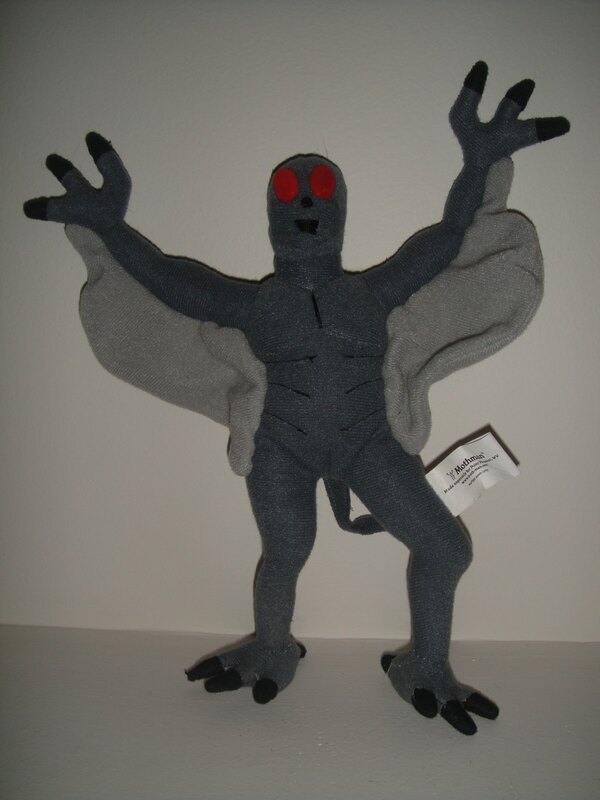 Every year that I’ve spoken at the Mothman Festival, I have taken the plush down off my shelf with the intent of showing it to Jeff Wamsley and asking him if he knows anything about it. And every year, I forget it when I’m packing. Maybe this year, I’ll remember. But if you have any information you can shed on this little guy, drop me a line. I’m all ears! Until then, here’s some links to more information about the whole Mothman mythos, including Jeff Wamsley’s Mothman Museum, as well as dates for this year’s Mothman Festival. Oh yeah, and if you happen to visit the Museum and bump into Jeff, be sure to tell him that Weird Willis sent you!